« Get Out Into It With Vermont Snowmobile Tours! It’s maple sugaring time! 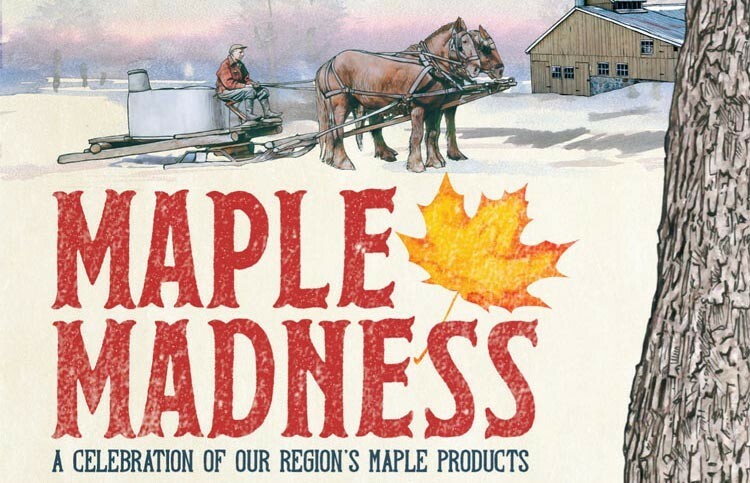 Come celebrate everything maple in Woodstock, VT during the annual Maple Madness event. March 25th and 26th, 2017. Vermont’s maple sugaring season typically runs from late February to April. Soon the days will begin to warm and the sap of the sugar maples will begin to flow. Sugaring time! Once that sap begins to run, it slowly drips out of the taps that have been driven into the trunks of sugar maple trees. Out of the taps the sap flows, down into the buckets that hang so patiently from the taps. The buckets are regularly checked by their sugarmakers and, when they’ve gathered enough sap, collected and taken to a sugarhouse. At the sugarhouse, this sap is cooked down, creating a lot of steam that rolls out of the houses. Consequently, the air of the countryside around a sugarhouse is laden with the delicious smell of pure, Vermont maple syrup! Heavenly. Vermont is the nation’s leading producer of maple syrup. As a matter of fact, our state produces 40% of the country’s maple syrup! It’s no wonder that maple sugaring time is not only a time-honored tradition but also one of celebration. Towns and counties all over Vermont celebrate this time with various festivals and events. Woodstock’s annual maple sugaring celebration is a two-day event called Maple Madness, held the last weekend of March. Enjoy a maple tree tapping demonstration and discussion. Enjoy the old-time treats of maple sugar-on-snow, maple butter popcorn, and more things maple. This is a free event open to the public held on the Woodstock Village Green. The Maple Taste Around is a Maple Gala held at Suicide Six Ski Area. Come out and sample a variety of maple-themed foods from local chefs and restaurants. Live music will keep you entertained as you taste all that our great, local restaurants have to offer. The Painted Maple Sap Bucket bids will be counted and the lucky winners will receive their winnings. So come on out to Woodstock on the weekend of March 25th and 26th, 2017 to celebrate Vermont’s Sweet Season. Visit www.woodstockvt.com for more details as this event approaches. Whenever you find yourself in the Woodstock, VT area, remember that Deer Brook Inn, your home away from home, is keeping a bed warm just for you. Our stylish, 1820’s farmhouse inn offers distinctive yet casual Vermont lodging. The four spacious guest rooms and suites of our Vermont B&B offer en suite bathrooms, high-speed Wi-Fi, and so much more. Book your stay today at Deer Brook Inn!